If you’ve been following our journey since the Referly days, you might remember the zombie VCs, the restart, the expanding vision, and the second seed round. This Series A round is an important milestone for me as a CEO, our team, our customers, the fans of what we’ve built and the army of loyal readers of the Mattermark Daily newsletter. It was incredible timing. 10 weeks prior I’d announced the shutdown of my previous startup, and begun publishing data-driven analysis of startups. To write these articles we built software tracking some signals inspired by Marcelo Calbucci’s original Seattle 2.0 Index and adding more of our own. Our prototype was far from ready, but there was no way we were going to miss this opportunity. I got in touch with Leena and offered her the exclusive on our launch, my cofounders and I scrambled to build a user management system and marketing website, and the three of us launched Mattermark from our apartment three days later. We had $200K in the bank, paid ourselves nothing, and had prepaid the rent on our apartment for a year to make sure we could “keep the band together” no matter what. 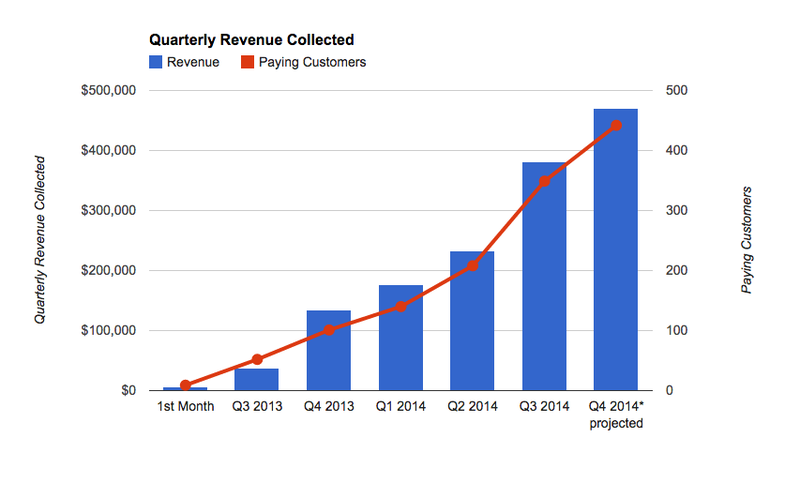 In the 18 months following our launch we experienced incredible revenue growth, from $4,491 in July 2013 to over $200K already collected this month; from 9 paying customers to nearly 500. To support this growth, our team had to expand too, and in the past year we tripled from 9 members to 27 — including adding 3 members to our senior leadership team in Sales, Data, and Product. Our teams range from 3-7 people and focus on software engineering, machine learning, data science, product, design, human resources, recruiting, sales, and customer success. 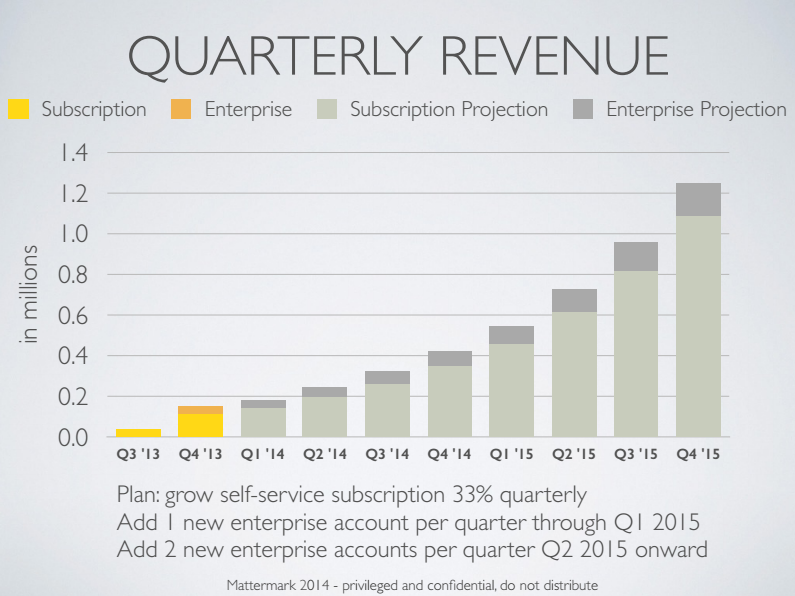 Coming off last year’s holiday break we attempted to raise our Series A in Q1. Our strategy was designed to efficiently test the market while being straightforward to our targets. We picked a dozen firms we wanted and lined up meetings. We had $300K in the bank and our team had grown to 9 people. As usual (for us), we had 4-6 months of runway and were tacking on more ad hoc seed checks whenever we wanted to hire someone new. The round didn’t come together, and one of our earliest customers Boris Wertz of Version One Ventures stepped in with a bridge note to keep us afloat. Other investors slowly began to follow suit, and over the next 6 months we raised ~$3.5 million more (essentially a small ‘tranched’ series A) from a group of un-syndicated investors. With money in the bank, but still rarely more than 6 months of runway at any time, we continued to execute against the plan we’d laid out in the original deck. 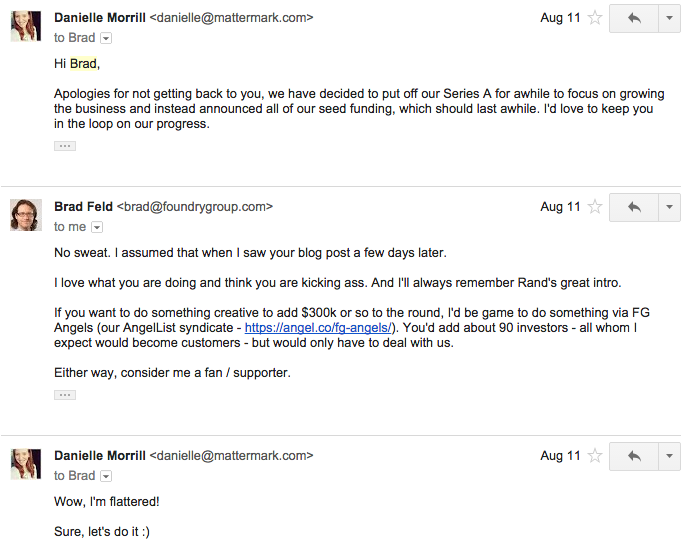 The FG Angels syndicate for Mattermark went live a couple days later on AngelList, and what started out as a $300K target turned into more than $1M in subscribers. In just a few hours we reached the 99 investor limit, and ended up raising $770K. Whoa. After such strong demand from the syndicate, several months of solid sales growth, new additions settling in to our senior team and fresh from a full month living and working on the NorCal Coast with my team to craft our 6 year vision, I did what I’d like to believe any startup CEO with a bunch of momentum would do just 5 days after closing a round: I asked Brad to lead our Series A.
I prepped a Series A deck once again and this time I used our data to build a new list of targets focused on B2B venture capitalists with deep pockets, long-term thinking, and glowing references from other portfolio CEOs. It turned out I didn’t really need it, at least in Brad’s case. I ended up pitching via email, doing a reference call with another portfolio CEO for technical diligence, and two weeks later I found myself in Boulder at dinner with my cofounders to meet with Brad and Seth for the first time. The next morning we returned to downtown Boulder to meet in the Foundry office for what I expected would be a more formal pitch. We started off with the slide deck and talked through it a bit, jumping around to the most relevant parts and the appendix to support some lines to thinking — but that was it. The rest of the meeting I could tell Brad and Seth were in “sell mode” as they let us ask them anything, but instead of just wrapping up the meeting I went through our list of thoughts from the night before and after a couple hours together we’d asked everything we could think of. We’re grateful to our old friend Andrew Hyde (Startup Weekend) for lending us his place and making us feel at home even when he was away, along with Foundry portfolio and community members who met up: Bart Lorang (FullContact), Yoav Lurie (Simple Energy), Clay Collins (LeadPages), Chris Moody (Gnip) and Nicole Glaros (TechStars). 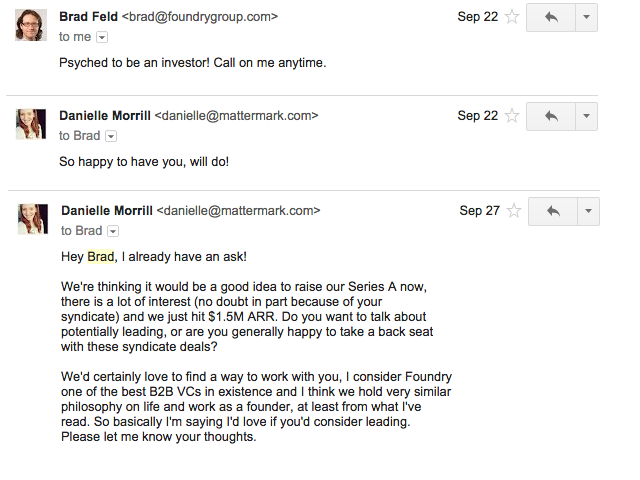 2 years, 6 months and 9 days after incorporating Mattermark we were finally raising our Series-freaking-A! I wanted to tell everyone! I wanted to sleep for days. I wanted to drink a bottle of champagne! I wanted to go on one of those silent retreats where you’re not allowed to speak to anyone for a week. I wanted to tell my whole team! But not until the money was in the bank. I first met Brad while covering events for Seattle 2.0. He was the first VC I’d ever seen in person, and looked nothing like the blue shirts and brown loafters stereotype with his crazy colorful button-down, leather loafers without socks and unruly longish hair. He came to Seattle to give a talk just after the economy crashed in 2008 encouraging entrepreneurs to soldier on. When I started raising seed funding for Referly my attorney recommended I read a book Brad co-authored with Foundry partner and cofounder Jason Mendelson “Venture Deals: Be Smarter Than Your Lawyer and Venture Capitalist”. It’s now required reading for all new hires at Mattermark. As we began the fundraising our Series A, I discovered there are many more books by Brad that are helping me get to know him better. Reading “Startup Life: Surviving and Thriving in a Relationship With An Entrepreneur” (which Brad wrote with his wife Amy) has been very helpful to Kevin and I as married cofounders, and we’d recommend to anyone who loves a startup obsessed cofounder, spouse, sibling or friend. I’ll be giving it to everyone in my immediate family this year. I’m also in the middle of “Startup Boards: Getting the Most Out of Your Board of Directors”. I’m looking forward to building a strong relationship and learning how to work well with Brad, and just this past week we’ve exchanged tons of emails about all sorts of things I can wait to work on in the New Year. Amazingly, this isn’t stressing me out — it’s exciting! Connecting with the right portfolio CEOs for different things I need to learn to do (and I look forward to giving back as well as soon as I’ve settled in), figuring out the best channels for communicating, expectations, strengths, pet peeves, rhythms, etc. are all part of successfully integrating him into our tight knit team. I was thrilled when he said, “it’s your data” after I checked in about writing this post with such a degree of transparency. I was wondering how I’d feel about “giving up” control, but that’s not how it feels at all. I still run my company. With Foundry’s money and collaboration I am confident this is the best move we could have made toward ensuring the company’s survival long enough to achieve our long term vision. I am 29 now, and I hope this is my last startup. I don’t want to build from the beginning stage over and over again… I’ve found the problem that I find endlessly interesting. Funding doesn’t mean we’ve won. It doesn’t validate me personally, it validates the importance of this fight and provides fuel in the long battle to organize the world’s business information. We are working on unearthing secrets hidden in plain sight, and in the process we are going to give business people back millions and millions of hours of their precious lives by creating the most useful corpus of knowledge on the world’s businesses.